We are offering Fiberglass Garden Fountain to our clients. 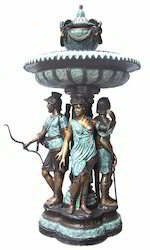 We are offering Fiberglass Sculpture Fountain. We are highly acknowledged organization engaged in presenting remarkable range of Fiberglass Fountain. Shiva Fibre & Chemical Trading Co. These fontainebleau fountains with windslow pedestal are fascinating and true reproduction of 18th century marble urn. We are a most trusted name among the topmost companies in this business, involved in offering Fiberglass Lotus Fountain.